If you live in or near Sacramento, you've probably heard the buzz about a (not so) little event called SactoMoFo. Taking place this weekend in Midtown's Fremont Park, Sacramento's first mobile food festival is expected to attract thousands of gourmet food truck enthusiasts and folks who are curious about what exactly a "gourmet food truck" is. 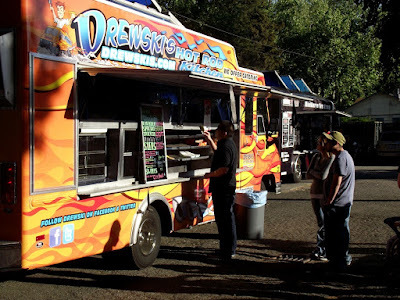 Though many of the vendors will be coming in from the Bay Area, Sacramento's own food scene will be represented by food carts from popular brick & mortar establishments like Chando's Tacos and established trucks like Tacos La Piedad, who operate just outside the city limits in order to avoid the stifling city ordinances currently in place. But there are a couple of new kids roaming around these Sac city blocks. Drewski's Hot Rod Kitchen & Mini Burger, are getting around the whole 30-minutes-in-one-spot rule by using social media. They tweet which area they're headed to so that followers can be on the lookout, and tweet again to let folks know their exact location. And so far it seems to be working. Business is going well for both, although some customers do end up getting turned away because the serving time frame is so small. This week I finally had the chance to sample the fabulous food from each of these gourmet food trucks during the Pre-SactoMoFo Tweet Up. Since I didn't have the opportunity to try too much from Mini Burger that evening (something I am SO making up for this weekend because I have the feeling EVERYTHING is going to be as amazing as that Ninja I tried), this post will focus on Drewski's and all the rich, decadent food he serves off that hard-to-miss truck. The first item I tried off of this tangerine truck with its hot rod flames and animated version of owner/chef Andrew Blaskovich, was the granddaddy of all the sandwiches he serves: The Hemi. The kind of sandwich that's so rich it almost requires a side of Lipitor to go along with it, this guy comes with Carolina pulled BBQ pork, 4-cheese mac & cheese, caramelized onions and melted cheddar, all piled onto brioche bread and grilled to perfection. O.M.G. Those of you who know me well know that this isn't something I would usually order, but I have to admit this sandwich is beyond tasty. The pork is tender and full of flavor, with the carmelized onion adding just the right amount of sweetness and the generous amount of cheddar a delightfully ooey-gooey mess. 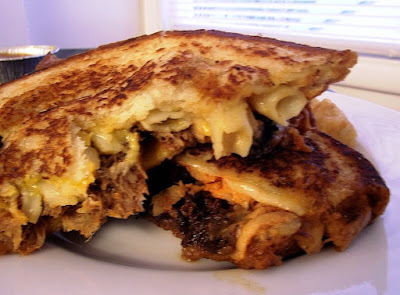 I was a bit worried about the mac & cheese at first, because I thought there might be a full serving on my sandwich, but there was just enough on there to add a new dimension of flavor & texture without overwhelming the entire experience. It was so rich & heavy (in weight... I'd be interested to put that thing on a scale one of these days, just to see how much it weighs) that it took me two days to eat the half I was given to sample, but trust me: that thing is just good. Next, I tried The Mustang, which is sort of a Asian-fusion grilled cheese. 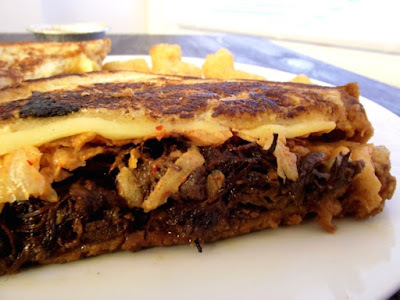 Piled high with braised Korean boneless beef short rib, house-made kimchi, crispy daikon strings, melted havarti and a Sriracha/wasabi aioli, this is another super-filling, super-flavorful sandwich with an extra spicy kick. I absolutely loved the beef and the way the daikon strings added a bit of crunch. But since Drew had had such a busy day before making it over to the tweetup, there was no kimchi left to put on to the sandwich, so I was a little bummed about that. He made up for it by adding a bit more of that spicy aioli and stepping out of his truck to apologize for the inconvenience. Right then & there he made an indelible impression: any chef who is willing to go the extra mile service-wise and do whatever it takes to make his customers happy has my vote. I was convinced to give his tater tots a try, which wasn't hard to do once they explained these little potato snacks were tossed in olive oil & rosemary. 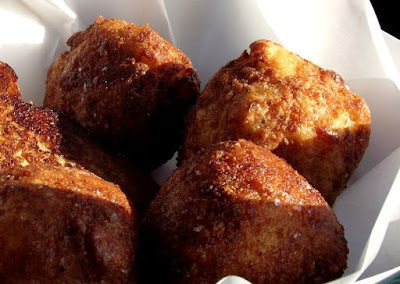 The tots were hot & crispy, but to me they were a bit light on the rosemary. Drew explained that some people found the rosemary leaves a little off-putting, so he & his crew are trying new ways to get enough of that rosemary flavor on there without using whole leaves. 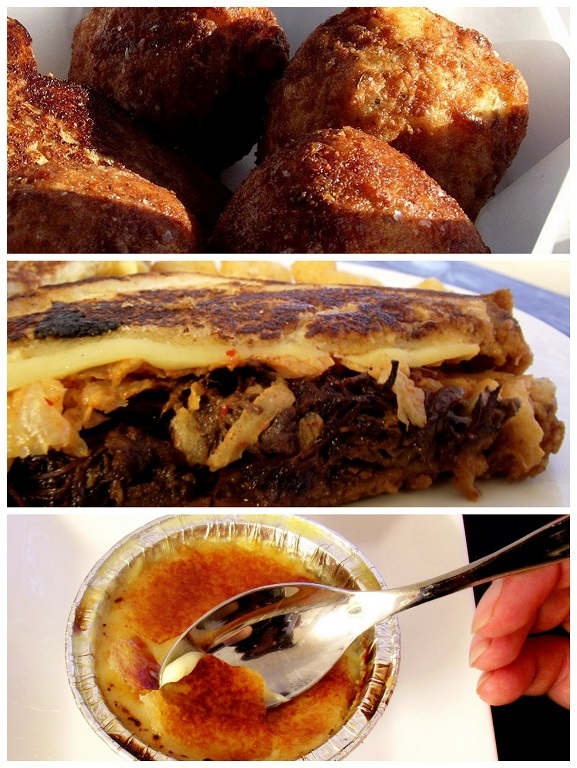 There was a lot more of Drewski's food floating around the parking lot that day, including deep-fried mac & cheese balls with compound truffle butter (I'm pretty sure that's illegal somewhere... sounds entirely too decadent) and The Special, a lighter sandwich featuring sliced apples, smokehouse almonds, wildflower honey and melted brie (!!!). Most folks were gracious enough to let me photograph their food since I was too full from the five or six bites of those ginormous sandwiches to eat anymore. That is, until Drew asked if I wanted to try some creme brulee. How this man knew about one of my many dessert weaknesses, I will never know, but I quickly asked for a to-go container so that I could take all of this yummy goodness - including my creme brulee - home. 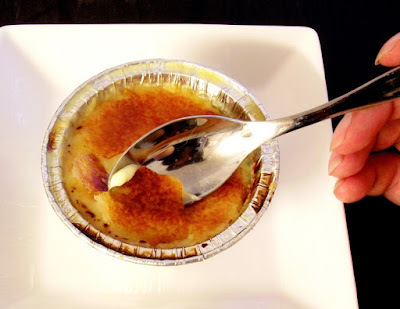 When I was finally able to dig into my dessert, I was as pleased as Amelie in that one scene where she holds up her spoon & the narrator talks about cracking the burnt sugar shell of the custard being one of life's simple pleasures. Drewski's homemade creme brulees have that perfect shell that cracks after a few taps with one's spoon and oozes warm creamy custard from within the small container. It was the perfect ending to a ridiculously decadent meal of samples. All in all, I really liked Drewski's. It's not health food and doesn't try to be; it's rich, decadent handheld comfort food that fills you up without emptying your pocket. And that's the best part about Drewski's, besides Drew himself: the value. Most sandwiches are $7.50, but their sizes & portions are so huge that I can almost guarantee you'll be taking half your meal home with you. Two meals for under $4 each? Poor Girl approves!